The Second Lady, Mrs. Samira Bawumia has commended the Member of Parliament for Kpandai, Honourable Mathew Nyindam for the construction of a new maternity block for the Kpandai Hospital to improve maternal and neonatal health in the area. The block which was built by Mathew Nyindam, Member of Parliament (MP) for Kpandai Constituency and First Deputy Majority Whip of Parliament, is not only to help improve maternal and neonatal health in the area, it is also expected, transform the lives of expectant mothers and improve their reproductive health. The new block was funded with part of the MP’s NHIS and Common Fund to cover eligible payments for the construction of the first class maternity ward in Kpandai, which has facilities including a theatre, labor and delivery wards, as well as doctor and nurses changing rooms. The new maternity block has the capacity to take care of over 2,000 pregnant women who visit the hospital annually for deliveries. 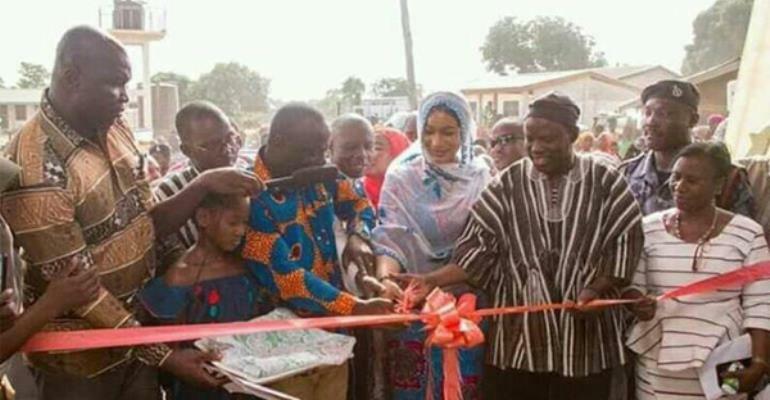 Speaking at a ceremony in Kpandai over the weekend to commission the facility, Samira Bawumia stressed that she is hopeful that the area would record a zero infant mortality with the establishment of the maternity block. Commending Mr. Nyindam for the facility, the 2nd Lady opined that the MP has demonstrated that he wants to serve the people and transform the constituency as a whole. According to her, the Samira Empowerment & Humanitarian Projects (SEHP) has provided up to 100,000 well-resourced birth kits to expectant mothers all across the country and assured the women of Kpandai that they would get their share very soon. She appealed to the people of Kpandai to take good care of the facility so that it would be beneficiary to other women in the area.